Retired from a long career in education, Mary Jackl now spends many enjoyable hours in the studio spinning, weaving, knitting, and felting. 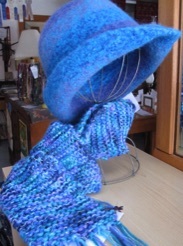 Since 1984 she has been spinning our wool and other fibers into skeins of award-winning yarns. 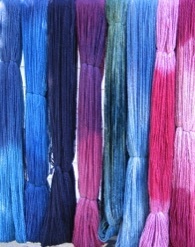 Beaded yarns and plain skeins in a rainbow of colors are available in our shop. 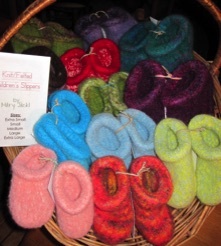 Many of Mary’s hand-knit hats are made of her own hand-spun yarns and then felted. Since 1988 she has been weaving handwoven rugs made from recycled items such as blankets, bedspreads, curtains, corduroys, denims, tablecloths, upholstery fabric and woolen clothing. The largest variety of rugs - over 300 - can be seen in early summer, before the outdoor art shows begin. So shop early for the best selection! 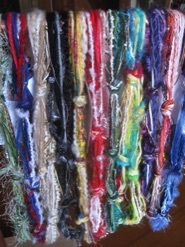 Check out our Events page to see where / when Mary will be selling her fiber arts this year. When not participating in an art show, Mary works in the shop almost daily. 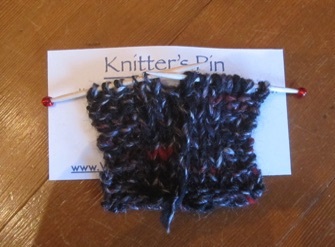 Stop in to watch her spin, weave, knit or felt. While here, make sure you stroll the many gardens including the waterfall and goldfish pond.